I have a cold. It’s an “island flu”. I know that if I go to the island nurse I will be handed a packet of amoxicillin (cure all antibiotic and one of about 3 things they hold supplies of out here). I soldier on the first two days on Panadol, strepsils and multivitamins. I sleep sitting propped upright against the wall so I don’t cough all night. I am on the hunt for limes which I’m told someone grows here. I become sleep deprived, grumpy, and lethargic and by the third day I’ve lost my voice altogether and now people have a legitimate excuse for ignoring me – they can’t actually hear me. It’s time for a rest day. And as chance would have it, there isn’t much we can do onsite anyway until our missing hardware arrives (story to follow). I find limes, finally cave in and start taking antibiotics, get my first nights sleep in 4 days and wake up able to speak again (even if I sound like a 13-year old boy). Health and wellbeing are pretty critical topics out here. On our minds even if we don’t speak about it all the time. More than we would ever be back home, we are watchful of each other’s health – whether it’s a scratch that’s turning into a gangrenous flesh wound or a cough which turns into a short fuse. Living in such close quarters and being so reliant on each other to complete this project makes this unavoidable and simultaneously difficult to accept. Everyone has their own theory on how wounds need to be treated, when drugs should be considered, and lots of (barely tolerated) advice. On top of stress about food supplies, drinking water, community liaison, paying bills and forward schedules, I’m kind of proud that we’re all still laughing together at the end of each day. At three weeks into the Nanumea install, we’ve achieved a lot but have had a few spanners thrown into the works along the way. Back in March during the delivery of all our freight to Nanumea, a hardware crate was mysteriously lost at sea (presumed dropped as it was being lifted from ships crane to lighter). On our way through Funafuti 4 weeks ago we located and “borrowed” the Niutao crate on basis that there would be time to ship a replacement crate to Niutao before solar installation works start there in November. But, sadly the Niutao crate didn’t have all the equivalent parts needed and our threaded rod, which is essentially the foot for the array framing, was not there. 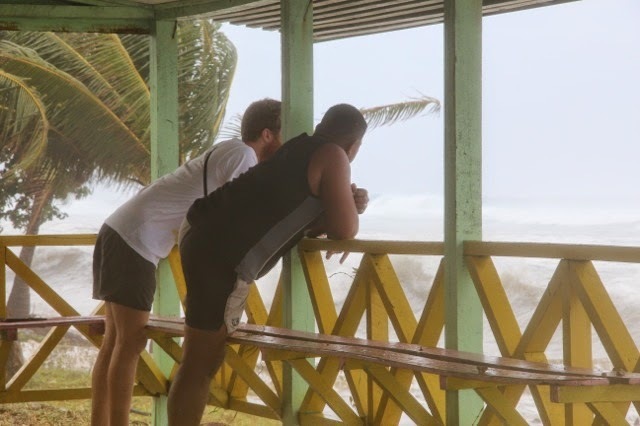 Alex was quickly dispatched from New Zealand to Funafuti as our logistics support officer – tasked with breaking into gear stored at Funafuti wharf to “borrow” threaded rod (and some washers which were also missing) from Niutao or Nanumaga. In the meantime, the team has soldiered on with emphasis on completing the battery and inverter rooms. Good news is that both were completed last week, all inverters finally turned on, and the system was turned on yesterday. Even better news is that the generator was used last night to successfully charge the batteries from midnight to 6am. From today onwards we will be trying to use the batteries to meet load throughout the night so that the village has 24 hour power. The generator will still run throughout the day to feed the village and top up the batteries. All signs look good. And I’m doing a little dance because it means the fans will be on all night and I might get some uninterrupted sleep! The somewhat interrupted installation schedule has created other opportunities for the team to get a bit more involved with the very active Nanumea community. When we first arrived in Nanumea, it was evident that the civil team who’d been here before us had not made great efforts to build positive or respectful relationships with their local workers or the local Kaupule. While disappointing for us, it also presented an opportunity for us to change their minds about having us here, and about helping us bring this project to completion. We arranged a pig and set a date for an afternoon barbeque with the workers, our housekeeper/cook and her troop of helpers. The workers set up a volleyball net between the makeshift hardware shed and our little digger and Roger introduced them to slow racing (last to cross the line wins). Nanumea, like most of Tuvalu, has a thriving community culture, centred largely around the Church. July 16th was the 84th anniversary of the Church and the celebrations had obviously been in preparation for months. Festivities kicked off at 4:30am. We were still in bed. But we did hear the 102 bell rings at 3:30am waking everyone up for the first service. Activities continued throughout the day and we were impressed to find everyone still looking bright-eyed when we joined them in the community hall at 6:50pm. We felt chuffed to be invited and overwhelmed to be offered a seat in the inner circle at the left hand of the Pastor! I have to assume that everyone had had an afternoon nap as we were informed that the dancing and singing would continue until 4am (yes, it’s a 24hour celebration!). After prayers and a couple of speeches, we were invited to eat first and led to the most enormous table of food stretching from one end of the hall to the other. There were coconut shoots, grilled fish, smoked fish, crabs, rice, pork, barbequed chicken, breadfruit, taro, pulaka, paw paw, fern shoots, donuts, cakes and twisties. Even after the rest of the village had mounded their plates and broken off into their little groups to eat and talk the table looked almost untouched. It was a reminder that no-one is hungry out here. While Tuvalu may be considered poor in technology and employment prospects, no-one is hungry or malnourished or homeless. It is a country rich in local resources and community. Once food plates had been set aside, north (green) and south (red) Nanumea set themselves up at opposite ends of the hall with a large wooden box positioned in their midst. The drumming (box beating) started. And then the singing. And then the dancers jumped up. Each team would try their best to out-drum, out-sing, and out-dance the other. The rounds just kept going, the drummers and singers getting louder, the dancers getting wilder and sweatier. By 10pm when they finally called it a tie, we were exhausted just watching. But now our short reprieve has come to an end with the arrival Friday of the Nivaga II and our missing threaded rod and washers. We spent Saturday drilling and setting rods and will be back on site Monday with our local workers to complete the array. By Friday, Nanumea will be the first Tuvalu system to go fully operational – only about 5 months behind schedule. Does your rash itch sometimes? Today is the first day since our arrival on Nanumaga when I have felt words running into my head and had the energy at the end of the day to sit at the computer and get them out. We have been working so hard for the past two weeks that, at the end of each day, it’s all I can do to crawl into the cold shower, dunk my concrete dust and sweat saturated clothes in a bucket and stare blankly at our assortment of tinned and dried food for dinner inspiration. I’ve barely been keeping up with e-mails - the outside world is not missing me very much. Getting off Nanumea and moving us and our gear to Nanumaga proved as adventurous as anything to date. The Baldur arrived to collect us and part way through loading our tools it became clear that the process was taking longer than the ship’s crew were obviously hoping. Anxiety started showing on their faces by about midday when the swell hitting the opening of the reef passage made it too dangerous for the small whale boats to navigate safely, loading was stalled and the ship drifted away. When she returned at 4pm we were being pushed to board but refused without our cargo – afraid that once aboard they’d tell us we had to sail for Nanumaga and leave our remaining gear behind. We finally managed to get from the panicked Captain the reason for the pressure to sail – the ship had left Funafuti amid a strong wind warning with barely enough fuel to make the round trip and no contingency for delays loading or unloading cargo (despite a contract with us covering daily rates for just this). How could this happen? How could a ship risk stranding like this? Luckily we were able to negotiate purchase of some spare diesel from the Nanumea Kaupule and TEC – 25 barrels which had to be moved to the wharf at 10pm that night and then carefully transferred to the ship the next morning in addition to all our own cargo. The end result was an unplanned 24hr delay in the charter but some assurance that we’d have enough fuel to unload on Nanumaga and for the Baldur to safely return to Funafuti. 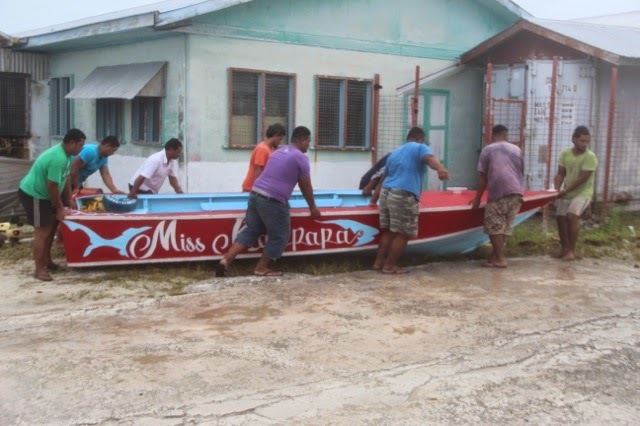 By the time we arrived at Nanumaga (about 4pm Tuesday afternoon), we were strung out and anxious that the unloading be completed by mid-afternoon Wednesday when the boat would have to set sail for Funafuti regardless of whether we were done or not. To their credit the crew and local labour we arranged on the shore worked through until it was too dark to be safe and were at it again by 7am the next morning. We were fully discharged by 2pm and watched the Baldur disappear into the distance. Hadley started the conversation… “Does your rash itch sometimes?” I can’t quite remember where it went from there but it wasn’t dinner conversation. My rash doesn’t itch so much as prickle. My skin is covered in small red spots – a heat rash? And I hate wearing clothes: they scratch and rub and need constant adjustment. Marty deals with his rash by going shirtless. Hadley wears indecently short shorts. I have been dreaming up the perfect island work wear – a pair of seamless, Kevlar embedded, lightweight overalls that somehow don’t actually touch my skin anywhere and steel-capped jandals(?). We all had expectations about what it would be like working out here. They weren’t idealised but they were kind of “all the best bits, none of the bad bits”. Nanumea was an island of flies. They were everywhere. And in everything. Although the Aussie’s in our party seemed less bothered by them than the Kiwi/Dutch contingent. The biggest challenge was keeping them away from open healing wounds – they would zero in on any scratch or sore and use their little suckers to probe for yummy morsels (I’m sorry but this is the imagery that stuck with us each day as we fought to keep wounds covered!). We discovered a new use for Chux-wipes and electrical tape – fly-guards. Nanumaga will be remembered for the ants. I wish I had taken a photo of the Nanumaga Kaupule guesthouse when we opened the door on that first afternoon. The floor was literally alive – crawling with yellow crazy ants which have almost taken over the island. There are nests under the front porch and they swarm over every surface including the mats and mattresses laid out on the bedroom floors. They even make it up into the camp beds with us at night – an unsettling feeling but one you get used to eventually. And there are holes and “soft spots” in the floor where the supporting timbers have become rotten and mice and rats freely rampage through the house. They are as bold as brass – gallivanting up and down the corridor in broad daylight. Our first full day on the island was spent trying to carve out a space to live alongside the ants and rats for the next month. And convert this semi-rotten shack into a haven from the daily toils of working in the heat, dirt, sand, grime and salt. We started unpacking food and setting up tables in all corners of the house with little bowls of water under their feet. The ants kept coming. And as we unpacked food from crates outside, the ants discovered this new source of wonders and seemed to come up through the ground itself. If you stood still for more than a second, they would swarm up your legs. I tried spraying my feet and sandals with surface (bug) spray, then a piece of cardboard to stand on, then I stood in a bucket of water. They were unstoppable. As for the rats, we’ve started feeding them. It seems easier to sacrifice some food than battle constantly with trying to keep everything away from them. They are keen on noodles. The big fellow in the front room is onto his third packet. 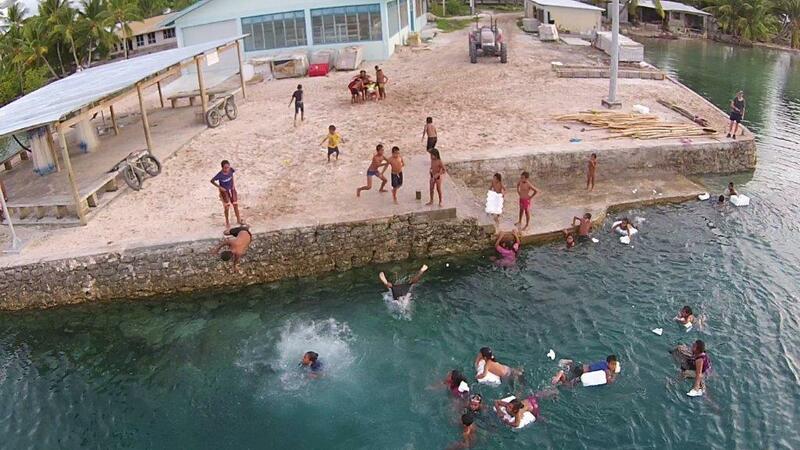 Nanumaga has also been the first island where falling coconuts have proven themselves a significant threat. The walk from the guesthouse to the powerhouse is only about 100m. But on the corner is a cantankerous old coconut tree with a mean sense of timing. After a combined 5 months now in the outer islands of Tuvalu, Marty has had two near-death experiences in under a week, and Shane one. The verge under this tree is littered with coconuts which have only just missed their target. We are cutting a wide path now. Amidst these challenges of daily life in the islands we are working hard, but we are also working smarter and faster. Two weeks after we started on site and we switched the system on this afternoon. Kaupule Secretary Sefuteni Liki was there to flick the switch – even if it was a bit of an anti-climax – solar doesn’t make much of a bang. Tonight the sweet joy of having a fan on all night and (hopefully) sleeping my first night through in weeks. As individuals, we are all coming to grips with our roles and getting our heads around how to manage our respective parts of the installation efficiently. No more missing some little step and having to retrofit something which would have been way easier to do 3 days ago. No more double doing. We’ve also had a fantastic group of local workers here on Nanumaga – a crew who’ve worked really well together and solidly from start to finish. 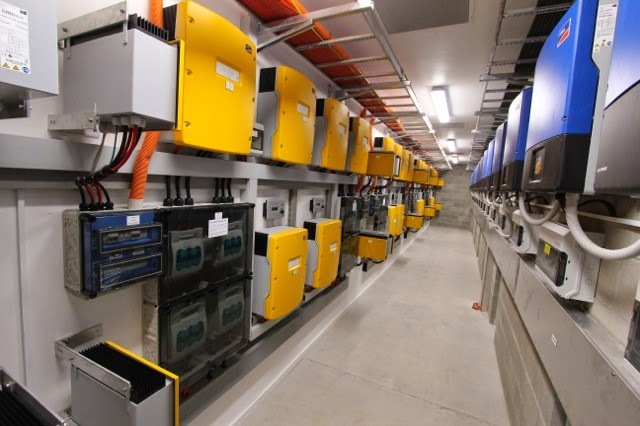 It’s a system that Powersmart, MFAT, TEC, and Nanumaga, can be proud of. We’ve also been lucky to have Falani from TEC here with us throughout the install. Falani works for TEC in Funafuti and has had an opportunity to see some of the other (non MFAT funded) systems going in on the central islands. It’s been wonderful for us to get some feedback from him on the quality of the work we’re doing and to hear through him how positively all the northern islands are viewing our work in the context of the broader Tuvalu Renewable Energy program. With the arrival of the Nivaga II and our missing threaded rod and washers, a flurry of activity began again on site. The array could now be erected, connected to the solar inverters which were already mounted and waiting, and the system turned on. It all began with a night time mission with laser levels to position the footing bolt holes and then hex nuts so that our arrays would be beautifully straight and level. The site was lit up like Christmas with red and green lines criss-crossing the ground as we scurried about with measuring tapes and spanners trying to avoid falling in cable trenches or tripping on stray roots. By midnight, nothing looked any different. But the proof would be in the final product… we’d have to wait and see. The next day work began erecting the panel framing on the concrete array foundations and from there it all moved relatively quickly. Within 3 days the team had mounted 768 solar panels and we’d begun connecting and testing strings. Within another 3 days, the array was complete with all cabling tidied away in conduit and behind the aluminium capping. Nanumea’s solar system was up and running – the village now enjoying 24 hours/day of silent, smokeless, diesel-less electricity. And those meticulously measured straight lines? Totally worth it. We were on site early to make sure everything looked perfect – the floors were swept and the sun was blazing down on the panels as if we’d arranged it especially after two days of miserable grey skies and rain. First to arrive were the Falekaupule members (the village elders) and the local Pastor. Shane gathered them all at the door to the inverter room and explained how their new solar power system will work. It was fantastic to then be able to show them in real time how well the system is performing. Already at 8:30am, the solar array was producing over 40kW and the village was drawing less than 15kW. The remainder was feeding into the batteries which had drained to about 83% overnight. By 11am, the batteries would be fully charged and the solar inverters would throttle back to drawing only what was needed to feed the village and keep the batteries topped up. At 9:00am, the primary school children announced their arrival in song – gathering on the entrance road and belting out a number from their English repertoire – something about branches on trees, nests on branches, eggs in nests, chicks in eggs, feathers on chicks, bugs on feathers – and all with actions and wide smiling faces. Shane delivered an abridged presentation and the teachers served as translators. There would be a string of unintelligible words and then you’d hear “solar”, “batteries”, “24 hour” or “no pollution”. It was fantastic to see the kids’ faces light up in comprehension although I think most were excited at the prospect that this all might mean bigger TV’s and the chance to stay up later. That night we were invited to an official community celebration of the new solar power station at the community hall. Our housekeeper Seleima decked us all out in stunning Tuvaluan outfits ensuring that Hadley and Marty had no excuse not to wear a skirt. We were promised a fantastic feast and wanted to contribute something. The best we could come up with was a loaf of our palagi (white people) bread, some berry and chocolate pikelets and coconut squid (a favourite recipe of coconut flesh BBQ’d in sweet chilli, soy and garlic). Next to the trays and trays of local delicacies, our offering looked very dull – we hoped someone would be brave enough to give it a try. One of the most important aspects of any formal gathering in Tuvalu are the speeches. These are delivered in a specific order based on position and occasion and can go on for a long time as it is an open floor and anyone can contribute as long as it is in the right sequence. Shane prepared a speech of thanks to all the various people on the ground who have made the project possible and our time on Nanumea much easier: the Kaupule and the village elders, our workers, the TEC supervisor and operators, our house-helper and her extended family of tom-girls and the school children for learning our names and greeting us with smiling faces and high-fives as we rode to work each morning. Fafetai lahi mote fakatokaga koulua, kiluga ia matou. Tali tonu te loto me koi a ne fakatoka neia. Mai konei, kati ten ate fakatokaga a matou mo koulua Nanumea kiluga ite solar. Mai konei malie te loto mote lua fakatokaga. Thank you so much for everything you’ve done for us. I believe that God has helped everything to go well. We are pleased to be able to present this new solar system to the island of Nanumea. We are grateful for all the food you have prepared for this celebration. And then the singing and dancing began. After the formal dancing ended, the free dancing began and we were gently encouraged to invite the community to join us on the dance floor. The chance to dance with a palagi was one of the big draw cards for the night and even the boys could not escape. 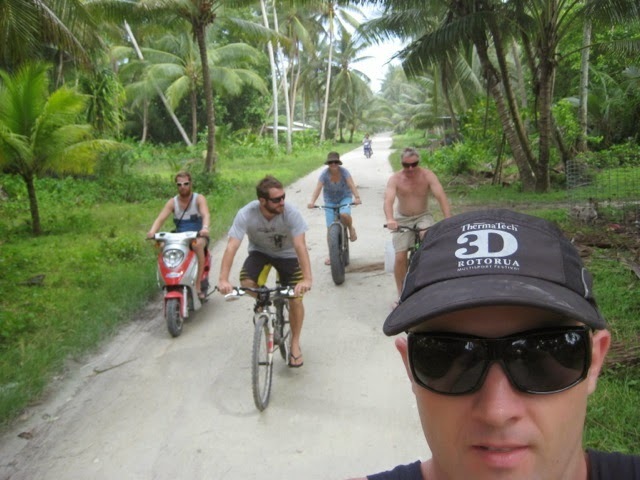 To the booming beats of Tuvaluan (and a few English 80’s hits), we bobbed about awkwardly for as long as we could sustain before collapsing in sweaty heaps and retreating home to cold showers and bed. Our return to the Tuvalu outer islands this time is aboard the MV Baldur, an ex-livestock carrier which was in use for a number of years ferrying cattle and sheep to and from the Chatham Islands off New Zealand. She is one of the few locally owned and operated vessels available to charter and, while smaller than the Komaiwai, has enough freight carrying capacity to be useful moving teams, tools and equipment going forward. We are still lowest on the priority list for access to the wharf. Finally on Thursday afternoon we are able to bring her up alongside and begin loading replacement cement for Vaitupu, our tools and spare equipment for Nanumea. 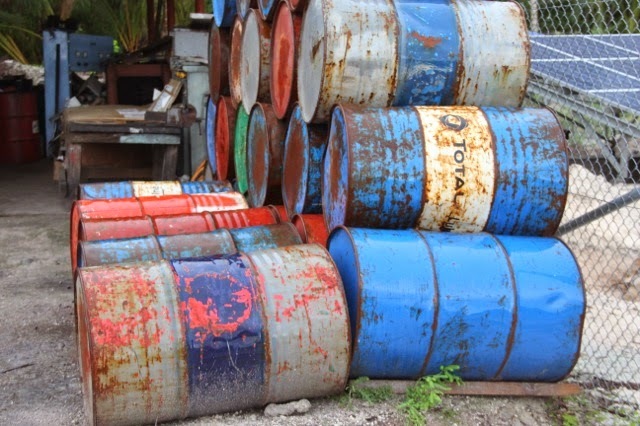 It is a struggle to get access to the port forklifts and our cargo is strewn all over the port. The forklift driver asks Shane which flat rack we need loaded and he points to the one buried seven deep. Suddenly the forklift is out of fuel and its smoko time. He disappears and we hope he is coming back. He does. And by 3am Friday morning, we have loaded as much gear as we can, having to leave behind 3 flat racks of cement for the ship to collect on return through Funafuti for Vaitupu. We rush back to our accommodation, shower, decamp and our generous landlord Pita delivers us and our trailer load of gear to the port. By 4am the hammocks are up and we’re all fast asleep while stevedores keep loading food supplies which we’ve offered to transport for local stores on Nanumea. We are hoping this earns us a few credits and some leverage when we ask to keep unloading on Sunday (Church day). We arrive Nanumea about 9:30am Saturday morning and the first task is to unload the whale boats which will be used to transport cargo through the narrow channel into the lagoon. With a 1-2m swell rolling the ship, even this is a wild affair and we’re all apprehensive about whether we’ll be able to unload gear at all. The crew are optimistic and familiar with local conditions. The smaller whale boats are more manoeuvrable in the channel entrance than the larger lighters which were being used by the Komaiwai. Even then, waves are breaking in the channel entrance and the pilots have to time their move. I decide to wear my lifejacket… just in case. Saturday and Sunday are spent unloading our tools and spares and then loading the McConnell Dowell tools which need to be returned to Vaitupu for completion of the array foundations there. We spend another half day sorting through damaged food crates and salvaging what we can. We’ve now consolidated the food crates from 3 islands (Vaitupu leftovers, Nanumea and Nanumaga). There were some very happy and well-fed rats living in the Nanumea food crate. And now some very happy and well-fed pigs gorging themselves on creamed rice, tinned peaches and muesli bars. Supplemented with some fresh supplies from Funafuti (eggs, onions, potatoes and cabbage) I am sure we will have enough to keep us going here and to carry forward to Nanumaga. Especially if we can source another 20kg tuna. And it’s not just our food which has been affected by the project delays and harsh conditions. All of our equipment has now been sitting on the wharf and out in the sun for up to 6 months and much of the waterproofing has disintegrated. Cardboard is a perfect rat nesting material and mould flourishes in moist, dark places. The gear shifting, unpacking, cleaning and repairing process is now a significant part of our work. We have brought some spares with us, borrowed from the Niutao equipment which was still in Funafuti. As we begin to put everything together it will become evident what damage is likely to affect completion of the system and we will make plans for any additional equipment or works. Despite these challenges, work started on site Tuesday with our team of 10 local workers and progress has been fast. Array cabling is almost complete, inverters are mounted, 6 out of 10 battery racks are in place and loaded and work will begin on array framing construction Monday. It’s going to be a busy few weeks but we’re all just pleased to be working again and seeing some progress. Meanwhile, in our evenings we’ve been bringing out the new toy which we brought with us this time – a quadcopter. The kids have very quickly worked out what it is and what it does. Their smiling faces remind us to forget about work for a few minutes and launch ourselves off the wharf into the water. None of us are sure how long we’ll be out here this time so these moments are very special. Our Nori sheets? Still good. At about 10:30pm Monday night it hit. We’d been waiting for it since about 7; the promised high wind/cyclone that has delayed our ship yet again and has left us all packed up with nowhere to go. We’ve been working 6 ½ day weeks for the past 4 weeks with a goal in mind to be finished here and ready to move on to Nanumaga in line with delivery of our equipment and ferry schedules. After all the delays in getting our equipment unloaded here, and the realisation that logistics will be one of our biggest challenges out here, it seemed sensible to work harder and faster, giving ourselves the biggest possible window filled with the most potential transport options to move on. On Thursday morning we had news that the Komaiwai was unbelievably running ahead of schedule and might be ready to sail past Vaitupu for a pick up as early as Saturday morning. All our hard efforts seemed worth it. We could be finished. We could be ready and packed in time. We worked until 11pm Thursday night and were back on site by 7am the next morning. And the site looks incredible. The new Vaitupu powerhouse is an impressive piece of engineering; the result of months of planning, agonisingly detailed calculations, measurements and drawings and a shipload of the finest German technology that money can buy. Amidst the frenzy of finishing last week, we opened its doors to the local community. On Thursday the primary school students and their parents came to visit. Still dressed in our sweaty, grubby work clothes, we were presented with beautifully made floral wreaths and a woven basket of coconuts that we devoured within minutes of their all heading home for lunch. On Friday morning the high school students arrived; ferried in by their Fijian teachers and primed with good questions. Thankfully no-one asked if the generator amp setting on the master Sunny Island was drawing the correct current from the generator… we were still tinkering. That night we celebrated everything we’ve achieved here so far with a spectacular feast. Hosted by our wonderful Fijian housemates, we ate crab and reef fish and breadfruit cooked in coconut milk and chilli and fresh made roti and a local fern, which has become our primary source of greens. The boys were dressed in brilliantly loud and colourful shirts and I finally had an excuse to bring out the Tuvaluan outfit which I had had made in Funafuti. As the night warmed up and our gin ration stretched, we sang songs of farewell and safe passage. 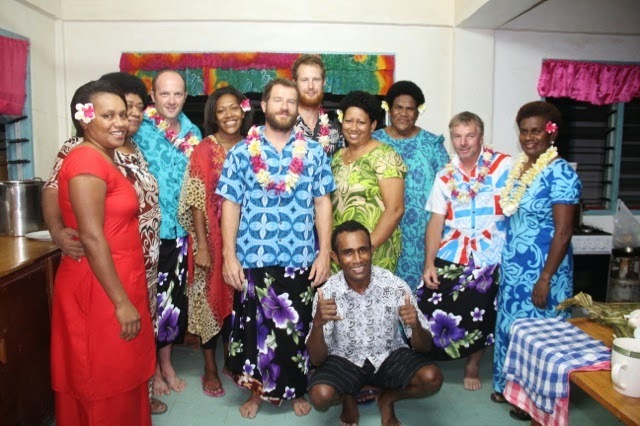 We have been promised that if PowerSmart comes to do a project in Fiji, we will be feasting every night. And so like sad prom dates, we are waiting at the curb for the limo. And a cyclone is coming. It rained horizonally for most of the day on Tuesday. The sparser of the coconut trees by the wharf, trying to stand solo against the wind, look weary, and someone has started moving boats off the harbour ramp. Apparently one was swept up on the water and came crashing down again. It has holes. By 8:30am Wednesday morning, it’s high tide. There is a crowd gathering in front of the meetinghouse above the wharf. Some of the locals report that they’ve not seen weather like this since the storm of 1991. Waves have been pushing higher all morning sweeping rubbish up onto the streets. 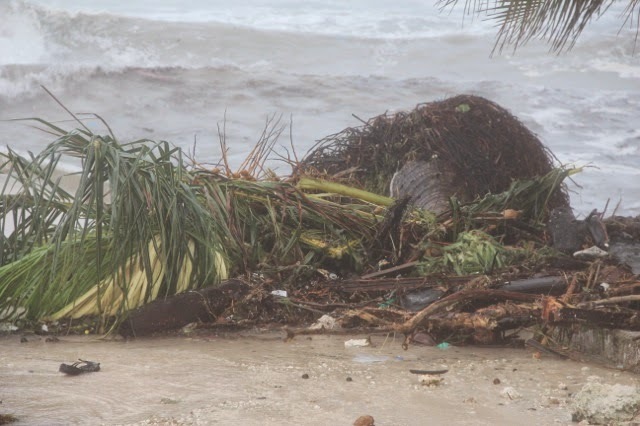 Two coconut trees have given way and come crashing down. With each set that comes in, the marker pole at the end of the wharf disappears in a spray of white and another wall of blue appears just behind it. There is no conceivable way that a little barge with a 40hp engine would make it through that harbour entrance unscathed. On a day like today, no ships will even be allowed to fix to Funafuti wharf; they are bobbing like corks in the middle of the lagoon, waiting just like us. Easy to reach these coconuts! Tuesday and Wednesday: North to north-easterly winds 15 to 25 knots gusting to 30 knots over open waters. 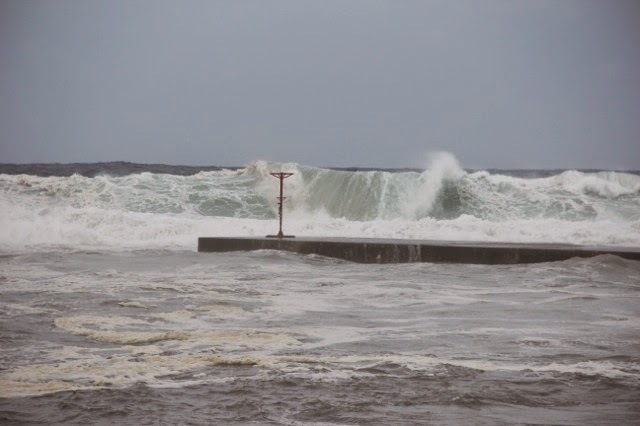 Seas rough with westerly swells 3 to 4 metres. Thursday? Westerly swells 4 to 5 metres. This afternoon we wanted to see for ourselves what damage this weather is causing. As we head to the western tip of the island we see pig pens washed away and outdoor kitchens being reinforced in anticipation of high tide which is due tonight. At the tip of the island, we traipse through the mud and peak out through the Pandanas palms. Something doesn’t look right. I realise that the horizon isn’t flat. It looks like a rolling mountain range; all dark green with snow-capped peaks. There is a point on the horizon where the very western-most corner of the reef is reaching out into the ocean and a great pyramid of water is pushed into the air. The wave peaks and breaks from this point, rolling toward us. I’ve never seen waves like this. My sandy, coconut tree covered, 2m high atoll, perched in the middle of this enormous ocean, feels very precarious right now. And to top it all off, we are on diesel rations again. We are down to our last 235L of fuel and the generator will only come on for 3 hours tonight and then another 3 hours tomorrow morning. With it our communications with the rest of the world as the satellite uplink relies on the generator and reasonably clear skies. I will try to get this post out tonight but it may be a few days before you hear from us again. It’s time to hunker down. To drink too many cups of tea and spend half the day scurrying to the bathroom. 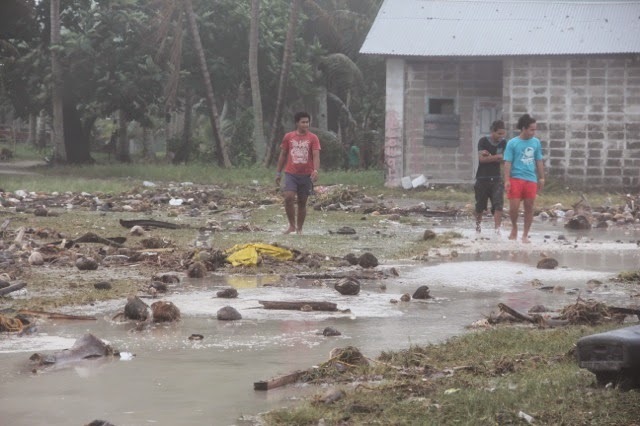 Or perhaps to bring out the scotch whiskey and work on our fantastical stories of the Tuvalu storm of 2015.